As a commercial property owner, you may wonder about the ideal frequency for commercial landscape maintenance. While you want your property to look its best to create a positive first impression, unnecessary maintenance can put a strain on your landscaping budget. Here are some factors to consider about how often you should have your commercial landscape maintained. Recently, E-landscape began work on landscape installation at the new $23 million project Chapel Springs Apartments. Chapel Springs is a four-story L shaped, garden style apartment complex that consists of 127 mutlifamily rental units designed specifically for seniors aged 62 years and older. If the pool on your commercial residential property is lacking the right landscaping, there are several factors to consider. Getting your landscaping correct can make all the difference when it comes to providing your tenants with an enjoyable outdoor living space. Many businesses use commercial fertilizers to help their landscaping thrive. Commercial fertilizers used throughout many landscaping projects can do as much harm as good when it comes to the surrounding environment. Yes, they've proven to be effective fertilizers, but at what cost to the environment? Spring is a time when landscapes thrive. Cleaning up winter muck and adding new plantings to a landscape design can showcase the appeal of surrounding structures. Yet, for a landscape to flourish, it must have the proper care and maintenance. It’s important to know what upkeep should be completed and when to do it. Contrary to the weather as of late, winters end is near. With that, it is almost time to stop worrying about ice and snow, and to start considering ways to prepare for the spring. While you may appreciate the warmer days; warmer days and cold nights can play havoc with your landscaping. Here are three ways to help protect your commercial landscape from the full brunt of the early spring’s thaw and freeze cycle. What is the impact on my commercial property of over-salting? If previous years serve as any indication, it won't be long before we're fielding phone calls from commercial property managers who are eager to know what the impact of over-salting is on their commercial property. Especially with some of the frigid weather we've been having lately, keeping properties safe is always at the forefront of owners' minds. A well maintained commercial landscape can add to the value of your property and landscape lighting is an important element of your overall design. There are many other benefits you can gain from adding lighting and here are a few of the reasons you don’t want to overlook this detail. Winter weather has arrived, and in many parts of the country snow has already started to pile up. For lots of business owners, winter brings added headaches when it comes to maintaining parking lots, paths, roads and other paved areas. Maintaining your business's paved areas and removing snow and ice is essential for encouraging business and creating a safe environment for your employees and customers. For the thousands of companies using pervious concrete or pavers, winter maintenance and snow removal is often difficult and time consuming. 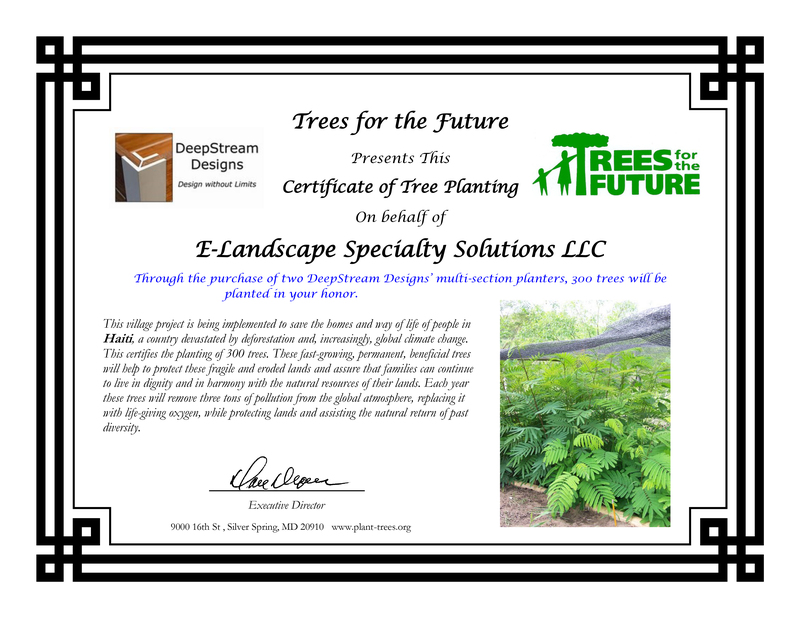 E-Landscape is proud to announce that one of our vendors has planted 300 trees in Haiti in E-Landscape's name. For every planter sold, DeepStream Designs plants 50 trees in Haiti for every planter sold through Trees for the Future. Copyright © 2015 E-Landscape Specialty Solutions, LLC.. All Rights Reserved.